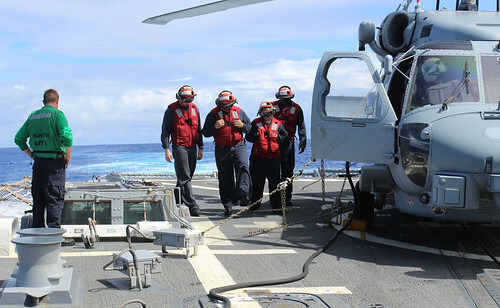 INDIAN OCEAN - The crew of the Arleigh Burke-class destroyer USS Kidd (DDG 100) is stepping up their search efforts for the missing Malaysian Airlines flight MH370 in the Indian Ocean with round-the-clock coverage. Kidd has been searching now for six days and the additional measures taken during this search mission are apparent both above and below decks. 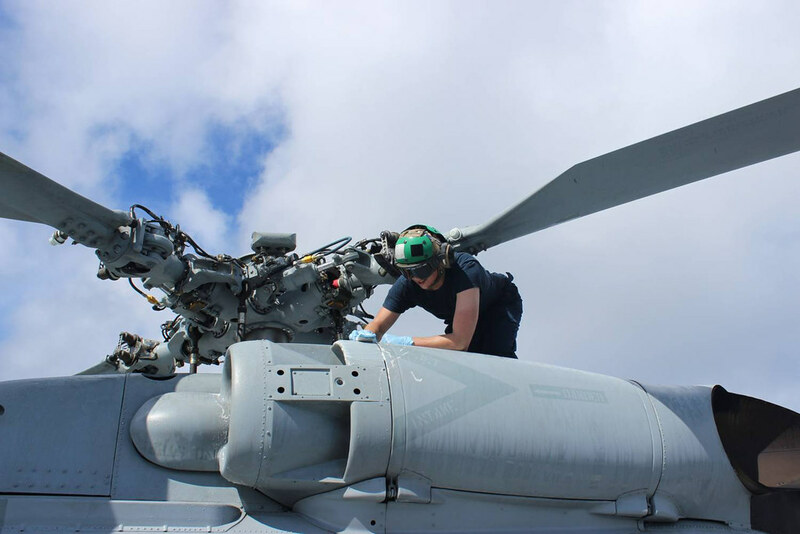 Extra look-outs have been posted for 24-hour coverage topside and the two MH-60R helicopters from Helicopter Maritime Strike Squadron (HSM) 78 are flying additional sorties each day. The ship's engineers have rigged additional lighting to aid in the search and are maintaining the engineering plant to its highest efficiency to ensure the ship is able to meet her mission. "The crew has responded to everything that has been asked of them," said Senior Watch Officer Lt. Cmdr. Melissa J. Szurovy. "Additional look-out watches are being stood by non-traditional watch standers and Sailors of their own volition are helping topside in our search for any sign of the aircraft. It is a true testament to the crew's fortitude to find this airliner." The air department, comprised of seven pilots, three rescue swimmers, and 18 enlisted maintainers has divided into day and night teams consisting of 12 hours shifts to support these round-the-clock flight operations. "Our maintenance teams work long hours to ensure our helicopters are operationally ready at all times to meet the mission," said HSM-78 Air Operations Officer Lt. Andrew Hoffman. "This allows us to constantly have our helicopters in the air to continue our search for the missing airliner. Further, our team is able to configure our helicopters to provide more space for this specific mission set which allows us to remain in a continued state of readiness for any sign of the aircraft." The responsibility of the safe launching, recovering and flight of the two MH-60R helicopters involves Sailors not only from the air department, but from a variety of other departments from the ship as well. Boatswain's Mates, medical personnel, and engineers are among the many Sailors involved in the helicopter operations to provide refueling, fire-fighting support, emergent repairs, assistance and supervision of all personnel and equipment to ensure the helicopters are able to safely remain in the air to continue the search for Malaysia Airlines flight 370.